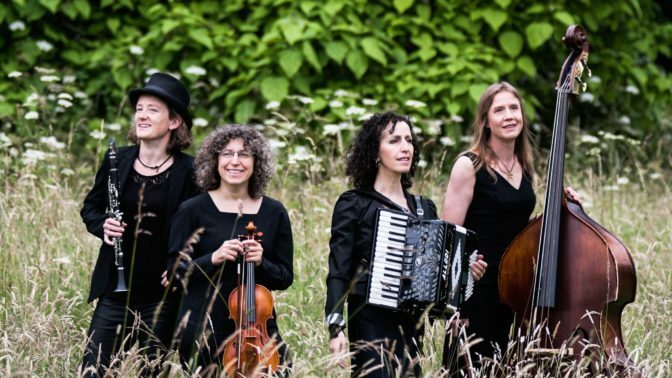 LKQ was formed in 2009 by a group of klezmer specialists keen to explore the almost-lost wedding music tradition of Jewish eastern Europe. The band was swiftly picked up by some of the UK’s foremost folk & world music promoters – Songlines Magazine, Continental Drifts and The Magpie’s Nest offered stages for the group’s unique combination of artistry and exuberance. The band has played UK venues and festivals including Kings Place, The Green Note, the Victoria & Albert Museum, Cafe Oto, Southbank Centre, Rich Mix, The Vortex Jazz Club, Songlines Festival and Blysh Festival. LKQ is part of rural touring schemes in Dorset, Gloucestershire and Wales, and the band is a firm favourite with charity ‘Music in Hospitals’, as well as a new recruit to Breathe Arts Health Research’s roster of artists. In 2012/13 they also performed in Norwich, Eastbourne, Colchester, Hastings, Cambridge.